One of the appraisers hired by two shady landlords to value properties they would sell to the city for $173 million was fired from his firm amid allegations of embezzlement, misappropriation and fraud, court records and city appraisal documents show. Joel Leitner, who formerly worked for BBG Inc. before his acrimonious departure from the appraisal firm, submitted a $200 million appraisal on the 17 properties in Jan. 2018, documents released late Monday afternoon by City Hall show. Just months after Leitner finished his appraisal, BBG alleged on May 29 in state Supreme Court that Leitner’s behavior at the firm constituted “embezzlement, material misappropriation, fraud and dishonesty.” The allegations were made as part of a counterclaim the firm filed in response to Leitner suing over being fired by the firm. Leitner and BBG were working for the Podolsky brothers, two shady landlords who just sold the buildings earlier this month to the city after years of charging taxpayers exorbitant fees to house homeless people in them. Court filings do not indicate that Leitner’s work on the Podolsky appraisal had anything to do with the firm’s decision to fire him in April 2018. During a Q and A with reporters Monday, city Social Services Commissioner Steve Banks suggested the firm is well-respected. “They have experience working regularly on affordable housing,” he said. Leitner’s appraisal handiwork went on full display late Monday afternoon when the city released documents connected to the controversial land deal that’s taken heat for its lack of transparency and potential conflicts of interest. The release of almost 2,000 pages of redacted appraisal documents came a month after the Daily News requested the records be made public and weeks after Comptroller Scott Stringer slapped City Hall with a subpoena to obtain them. The following article by Richard Steier from The Chief is being republished in full with permission of the author. HUCKLEBERRY FINN HE’S NOT: Mayor de Blasio may feel like he’s lighting out for the territory every time he spends a weekend on the presidential campaign trail, but his continuing to accept political contributions from those with ties to notorious developers bruises his image as a reformer and suggests he’s a machine pol in progressive garb. State Sen. John Liu, a 2013 mayoral rival, said Mr. de Blasio had sought abolition of an admissions test for specialized high schools because that was easier than improving education in black and Latino neighborhoods. Call me a cynic, but lately every time I hear Mayor de Blasio launch into his spiel about how there’s plenty of money in this city/country/world but “it’s just in the wrong hands,” I can’t help but think of the Podolsky brothers. That would be Stuart and Jay, the offspring of Zenek Podolsky. The father launched the family real-estate business with crude-but-chilling simplicity: during the mid-1980s he paid a gang to use intimidation and harassment tactics to clear out buildings under rent control and rent stabilization so he could jack up rents. Zenek Podolsky got off with a brief prison sentence, buying leniency by handing over three Upper West Side buildings to the Coalition for the Homeless and testifying against the former head of the Taxi and Limousine Commissioner, Jay Turoff, about a scheme involving the sale of electronic taxi meters. Stuart and Jay Podolsky got off with virtually no jail time. Andrew Rice, who reported on the Podolsky brothers’ operations early this decade for New York Magazine, found that they stopped emptying buildings by moving drug addicts, prostitutes and strong-arm men into vacant apartments to make longtime tenants’ lives miserable in favor of operating buildings where half the units offered shelter for the homeless under city contracts. Ownership wasn’t in their names; they used shell companies that listed their lawyer’s name and that of Alan Lapes, who managed the properties for them. The New York Times, following up on a couple of Daily News articles, reported earlier this month that the city began contracting with the Podolsky companies for buildings for its cluster-site program for the homeless in 2001—the final year of Mayor Rudy Giuliani’s administration. Over a five-year period beginning in July 2013, the Department of Homeless Services paid those companies $189 million for use of cluster-site apartments and single-room occupancy buildings. Mr. Rice in late 2013—as Mayor Michael Bloomberg was wrapping up his third term in office—reported in New York magazine that the Podolsky brothers did little to correct their properties’ serious deficiencies, and took extra steps to cover their tracks by having their building managers use fake names when speaking to tenants or DHS employees. His tenant-rights advocacy during his time as Public Advocate was burnished by the fact that his office annually published a list of the city’s worst landlords, adopting a tradition begun decades earlier by the late Jack Newfield as an investigative reporter for the Village Voice. Yet once he took office, the city continued doing business with the Podolsky brothers. Mr. Rice had been told by DHS employees that the Bloomberg administration worked with them because it needed beds and couldn’t be that choosy about the suppliers. The need grew dramatically once Mr. Bloomberg ended a policy of allowing the homeless to jump to the head of the line for Federal Section 8 housing vouchers, which Patrick Markee of the Coalition for the Homeless told New York was “literally the biggest policy mistake of the Bloomberg administration” and a major factor in the explosion of families who were homeless. And then on Jan. 10, during the same State of the City address in which he lamented that there was too much money in the hands of the wrong people, the Mayor signed an executive order establishing the Mayor’s Office to Protect Tenants. It stated that the Wall Street Journal had recently reported the brothers were under investigation for possible tax evasion. The story noted that the Mayor had returned a $4,950 political contribution from Alan Lapes—the property manager used by the Podolsky brothers—but kept more than $10,000 in contributions bundled through the late Robert Hess, who after serving as Mr. Bloomberg’s Homeless Services Commissioner had formed a non-profit, Housing Solutions USA, that was tied to the Podolsky’s. Less than two months later, however, Mr. Gartland reported that the deal was nearing a conclusion. The biggest news was that the price-tag for the purchase of the 17 buildings, initially reported to be between $40 million and $60 million, had zoomed to $173 million, with the city financing the purchase and then having non-profit groups take over day-to-day management of the properties. Mr. Gartland quoted an anonymous city official who attributed the jump in sale price to the Law Department’s seeking an appraisal from Metropolitan Valuation Services of the value of the 17 buildings, which came in at $143.1 million. That jump in valuation wasn’t enough for the Podolsky brothers: they demanded $200 million. Rather than bring in another appraiser, as they were entitled to do to give them added leverage, city officials decided to virtually split the difference between the appraisal and the brothers’ demands. The deal has since been completed. The city could have sought to seize the properties under eminent domain, but Social Services Commissioner Steven Banks, who distinguished himself as a lawyer for the homeless before joining city government, noted that could produce a lengthy court fight that would tie up the properties at a time when DHS sorely needed the additional beds. Then The Times reported April 4 that the lawyer for the landlords in the discussions on the deal was Frank Carone, who also serves as counsel to the Brooklyn Democratic Party. Willie Neuman’s story stated that Mr. Carone and his wife had each made the maximum individual donation of $4,950 to Mr. de Blasio’s re-election campaign two years ago, and that the attorney had donated the maximum $5,000 to the Mayor’s Federal political-action committee, Fairness PAC, and helped solicit additional donors for the fund, which has covered the Mayor’s expenses in recent months for his travels to early-primary states as he considers a run for President. No doubt if asked, the two men would deny they have had any conversations about a possible future run for office by the Mayor’s wife, Chirlane. 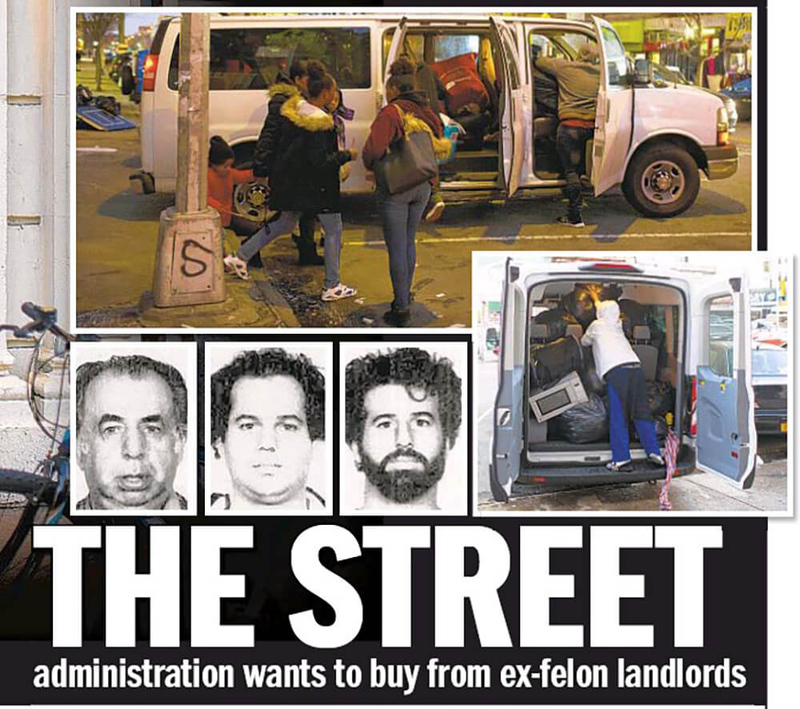 Then Mr. Gartland reported April 10 that Human Resources Administration Chief Contracting Officer Vincent Pullo a year ago demanded that a homeless-service provider in The Bronx sign an affidavit swearing that the nonprofit had no connection to the Podolsky brothers. Mr. Rice reported in New York more than five years ago that Housing Solutions had taken over contracts belonging to the nonprofit, Aguila Inc., and its CEO, Jenny Rivera, told The News April 8 that she was providing services to homeless families at Podolsky brothers properties and that the city knew this. But Ms. Rivera showed Mr. Gartland correspondence she had last year with Mr. Pullo in which she sent him a signed lease for the Podolsky buildings and he responded with an e-mail requesting an affidavit asserting that Aguila “has no affiliation with” the Podolsky Family (any and all members)” or Mr. Lapes, their property manager. It seemed clear that the de Blasio administration was moving forward on the deal and wanted to have a document indicating that it was not doing business with the Podolsky brothers. There have been no reports of them having made political contributions to the Mayor or his PAC, but they have long been known for making business transactions in the maiden names of their wives. It’s true that the city’s extensive dealings with the Podolsky brothers, despite what Mr. Morgenthau 35 years ago described as a kind of terror campaign against their tenants, dated back two Mayors. But a key component of Mr. de Blasio’s rationale for his first mayoral run in 2013 was that he would be more sensitive to the needs of the less-fortunate in the city, and less-solicitous of the wealthy, than both Mr. Giuliani and Mr. Bloomberg. That has been true for his most-prominent campaign issue, improper stop-and-frisks by police, although sharp scaling-back of abuses began during Mr. Bloomberg’s final two years in office even before a Federal Judge ruled that the NYPD had been conducting the program in a way that violated the U.S. Constitution. But the lead-paint contamination suffered by hundreds of children in Housing Authority apartments because of a four-year-plus stretch in which no inspections were conducted was treated by the Mayor as less a public-health concern than a political problem. He noted the Bloomberg administration didn’t do inspections in its final two years, and he kept HA Chair Shola Olatoye in her job even after it was revealed that she had lied to the U.S. Department of Housing and Urban Development in 2016 about inspections having been done. Even a subsequent lie before the City Council late in 2017 about the training given to the employees who eventually did the inspections did not prompt him to jettison her immediately; she hung on for two months after that misrepresentation came to light. Six months later, she became vice president of business development for Suffolk Construction, a Boston-based contractor seeking to expand operations in New York. It was an impressive landing for someone who had been tarnished both by the deteriorating conditions in some HA developments and her lies about efforts to correct them. Some of the mystery about her rebounding so well was dissipated when it was announced that a Boston fund-raiser for Mr. de Blasio’s PAC April 5 was being hosted by her boss, Suffolk CEO John Fish. Notwithstanding his claims that he’s a reformer, Mr. de Blasio has demonstrated more than a few times that the expressway to his good graces is paved with political contributions. It was recently reported that New York City landlords, Jay and Stuart Podolsky are raising millions to house homeless New Yorkers after selling over 20 buildings to the city for a total of $173.5 million — more than the appraised value. Financial documents show that the Brooklyn born brothers raked in approximately $188.7 million through the leasing of various properties over the last five years. After selling 21 buildings to the city above market value, they will retain seven buildings to house the homeless — taking in millions of dollars. New York City officials told the New York Post last Thursday that the program will cease to exist by December of 2020. “As we continue our shelter transformation plan, we are phasing out all of their remaining shelter locations by the end of next year,” Isaac McGinn, a spokesman for the City’s Department of Homeless Services, told The Post. The brothers raked in massive profits by providing space to the city for the purpose of providing shelter to the city’s homeless population under two different programs — traditional shelters and “cluster” units. The City’s purchase of the 20 plus apartment buildings in Brooklyn and the Bronx formalized the acquisition of the clusters that were owned by the Podolsky brothers and earned $48.6 million between July 2013 and June 2018. The pair also leased eight buildings as additional shelters, where they made a larger profit — $140.1 million over the same five-year period of time. Someone who is employed by the City of New York told The Post recently that they shut down one of the Podolsky standard shelters in December 2018, reducing the number of shelters owned by the pair to seven. 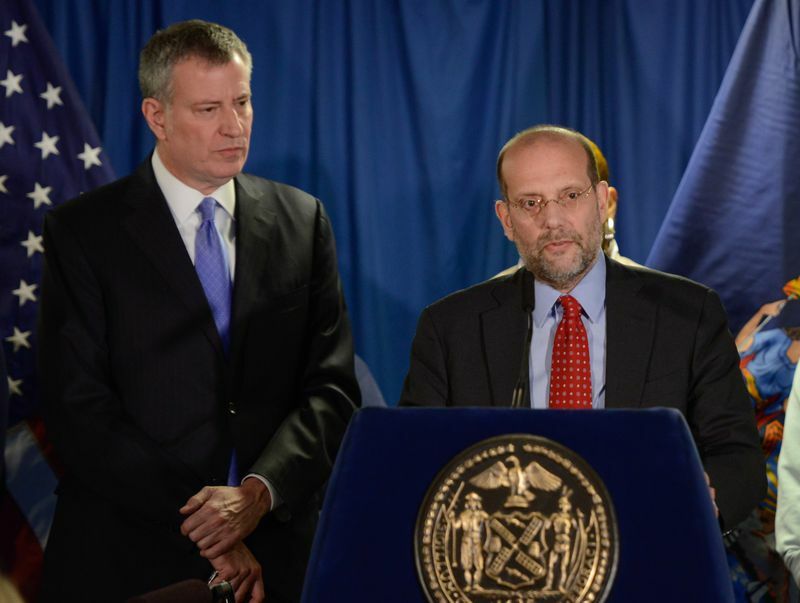 New York’s Department of Homeless Services never entered into an agreement directly with the brothers, but, rather signed contracts with nonprofit organizations which rented space in buildings owned by the pair and then billed City Hall for reimbursement. The unusual payment relationship hid the amount of money which the brothers made in a relatively short period of time. The city’s $173 million purchase of 21 buildings from the Podolsky brothers has attracted scrutiny because of the sellers’ past, their political connections and the price tag itself. A late Monday document dump is poking even more holes in the official version of events. According to 2,000 pages of documents subpoenaed by City Comptroller Scott Stringer, City Hall overvalued the buildings by $26 million using faulty rent assumptions, the New York Post reported. The city reportedly has gone easy on problem landlords in the past. The New York Times reported last year that officials have taken a “gentle hand with landlords who deprive tenants of basic services, declining to enforce the maximum penalties for even the worst offenders,” detailing how “neglected repairs” end up forcing tenants out. On Sunday, he said in an interview that he wouldn’t rule out running for president in 2020, and urged the Democratic Party to take “bolder” positions similar to his own. Republicans, though, were disturbed by the extent of Hizzoner’s plan and charged the idea was more suited to communist dictatorships where land and property seizures are commonplace. Malliotakis said the proposal was also hypocritical of the mayor, as she says the city runs some of the worst housing via the NYC Housing Authority. She also expressed some doubt as to how his plan to seize property would fare.